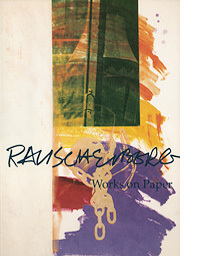 Advertising & Publication Design With Rauschenberg's exhibition Works on Paper 1990 at Knoedler & Company, he shifts with consummate skill and agility from painting and sculpture to painting on fabric-laminated paper with acrylics. All of Rauschenberg's work has a fundamental emphasis on process which is exemplified by these exquisite works. We designed an oversized 10-1/2 x 14" catalogue/opening invitation that featured his fresh new work Lock-Out with his trademark signature and furthered the theme on the Art in America advertising. The catalogue was printed on a beautifully-textured artist's woven cover paper with the Smyth-sewn stitching revealed in the spinewhich further reflects Rauschenberg's focus on the art-making process. The framed offset-lithographic press sheets from Rauschenberg's Works on Paper catalogue adorn our office walls to this day.